The Coolpad Note 6 seems like it’s lagging behind its rivals. But being an offline only offering, the Note 6 will be more readily available than most of the critically-acclaimed mid-range phones. That seems like a conscious decision on the part of Coolpad as the brand remains popular in the tier 2 and tier 3 cities where online shopping is still a novelty. But even being an offline-only brand isn’t enough to escape the clutches of the intense competition that the mid-range market is seeing. Most of the online-dominating brands are rapidly expanding in the offline market include Xiaomi, Honor and Moto and Coolpad might have a hard time competing with them with the Note 6. Coolpad is hardly the name that comes to mind when talking about mid-range and budget smartphones. The likes of Xiaomi, Honor and Moto have kept customers busy while the Chinese company had been missing in action for a while now. 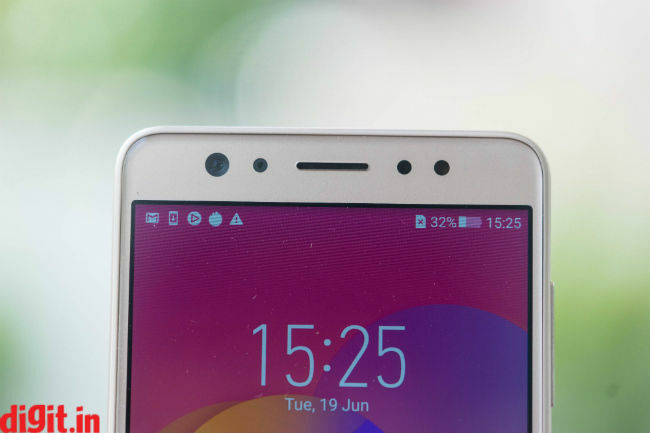 After a recent reorganisation of its business and injection of fresh funding, Coolpad is back to the smartphone business. It’s latest offering is the Coolpad Note 6 which succeeds the Note 5 launched two years back. Coolpad uses its Note lineup to showcase its latest and best and the Note 6 somewhat carries that philosophy. But does the company’s latest and best really match up to what its rivals have to offer? The Coolpad Note 6 looks different. It has a metal body sandwiched between glass on both sides. The glass panel at the back has a groovy cutout around the camera unit, but the glass itself seems quite unnecessary. The glass simply glistens against the light and doesn’t really add to the design in any way. Moreover, glass isn’t even durable and customers on a tight budget are more likely to pass on the phone for a metal unibody one. Typically in this price segment, smartphones tend ot have all-metal construction lending them a certain amount of robustness and durability. 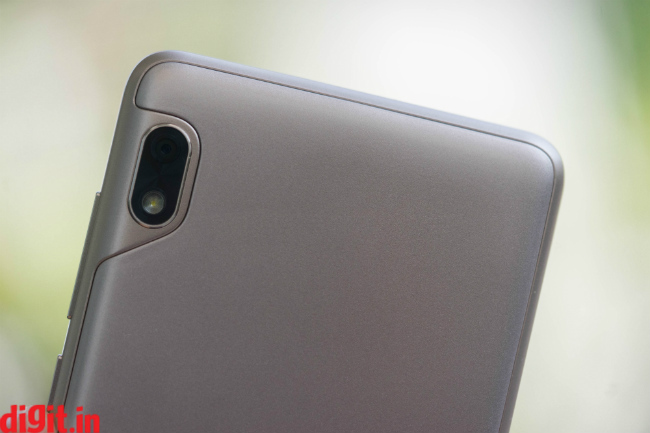 This is of course based purely on what the people want, and the Coolpad Note 6 tends to go against the grain here, which is why it may not strike the right chord with the buyer. From the front, the Coolpad Note 6 clearly takes inspiration from Samsung’s older J-series phones. Not that Samsung is a real innovator when it comes to budget phone designs. 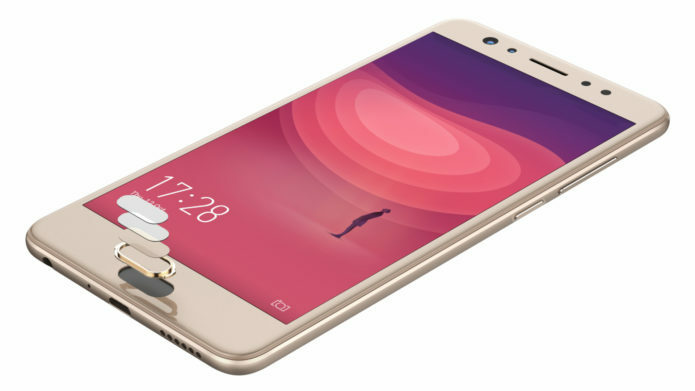 I suppose Coolpad was gunning for the familiarity of the design, especially considering this is a phone that people will touch and feel before buying. In that regard, the glass design works. When you’re holding the phone, it doesn’t feel any less premium than other good-looking rivals like the Honor 9 Lite. 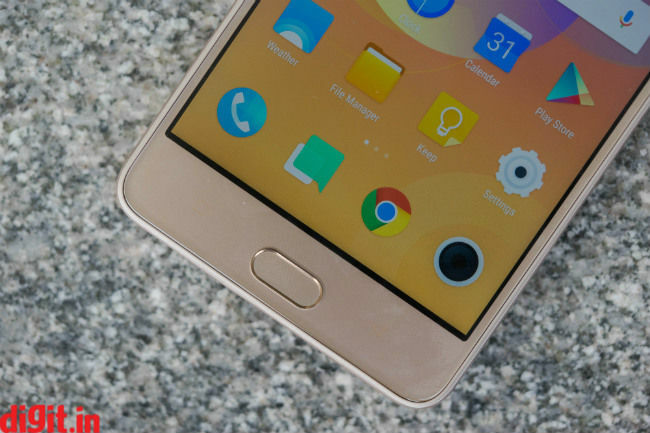 There are significant bezels all around the phone and the bottom chin is used for capacitive navigation buttons. 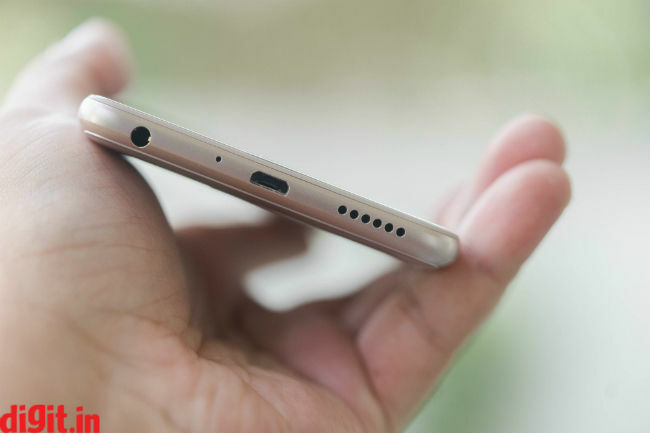 The fingerprint sensor is embedded in the home button below the display. On top is the dual camera array along with a LED flash, both being attractive proposition for the selfie-crazy Indian market. The Coolpad Note 6 is still living in the past. This is evidenced by the use of a 16:9 display. The 5.5-inch panel seems wider in comparison with the newer, taller displays and after using the new display format, the older panels seem unwieldy. But for those who haven’t yet gotten a taste of the new taller and thinner displays, the phone will seem compact enough to use comfortably in most situations. The full HD resolution helps and because of a higher 401 ppi pixel density, content seems sharp enough for the price. Surprisingly, the CoolPad Note 6 registered higher brightness levels than the best-selling Redmi Note 5 Pro. That definitely means better legibility under direct sunlight. There was also no unnecessary glare from the panel that usually hinders visibility under harsh light. There is some visible loss in colours at peak brightness, but chances are you most likely won’t notice it. The Coolpad Note 6 provides options like adaptive brightness that tweaks the brightness based on the ambient light, and ambient display that lights up the screen when you receive a notification. Furthermore, there are options to cycle through various screen modes. ‘Vivid mode’ ups the saturation while the ‘Natural mode’ puts a cooler tint. There’s also an ‘Eye Care’ mode that puts a yellow tint very similar to the Night Mode on various other smartphones. Overall, the display seems to be one of the few things that are genuinely good about the device. Even though it doesn’t have the newer aspect ratio, the 5.5-inch panel makes up for it in terms of high brightness and clarity of content. 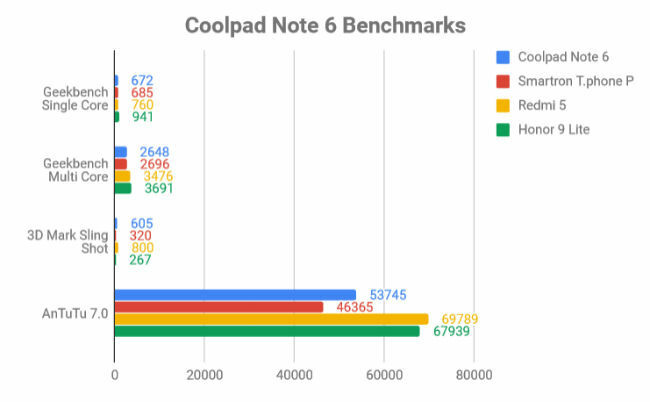 The reason why I keep saying the Coolpad Note 6 is lagging behind the competition is partly because of its performance. The Note 6 is still stuck at a time when a compromise in performance was expected in a budget smartphone. Entry-level phones in 2018 aren’t cutting back on the firepower. In fact, the new Realme 1 brings a Helio P60 chipset to the sub-10k segment. The chipset usually powers phones above Rs 20,000. Furthermore, there’s the new Redmi Y2 that brings the reliable Snapdragon 625 down to the budget segment. And then again, there are a couple of phones running the new entry-level Snapdragon 450 chipset that is quite akin to the Snapdragon 625 in terms of architecture and performance. 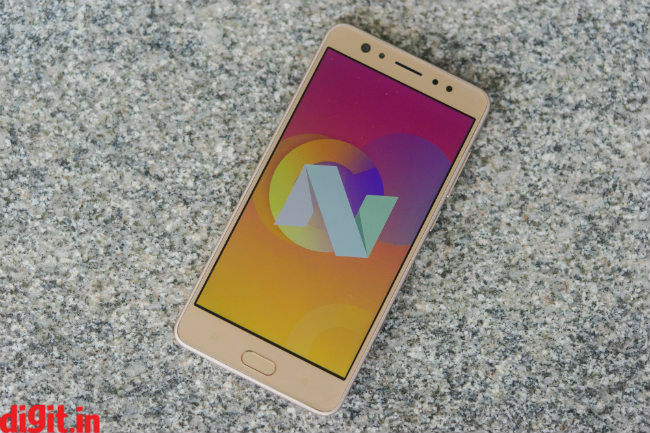 In that regard, when the Note 6 launched with a Snapdragon 435 chipset, it was bound to lag behind. The Snapdragon 435 has powered entry-level smartphones of early 2017 and doesn’t seem appropriate for use in mid-2018. It’s performance, even though stable, isn’t going to help run multiple apps and games. The Coolpad Note 6 quite evidently lags behind its primary competition, but it fares well among other offline-only offerings. In Geekbench 4’s Single core and Multi core tests, the Note 6 scores 672 and 2648 respectively, which is far lesser than what the Redmi Y2 registers, let alone the Redmi 5. But it’s right up there with the Smartron T.phone P, the 10.or G and the Kult Gladiator, all three of which are popular options in the tier 2 and tier 3 cities. In real world usage, the Coolpad Note 6 feels visibly slower than other phones at that price. There are frequent frame drops while playing graphics-intensive games like PubG Mobile. Less powerful games like Subway Surfer and Candy Crush will work well. Browsing Facebook, Twitter and the likes are just about stable, although filling up the storage might change the experience of browsing for the worse. The camera too takes some time to launch and you might lose out on those precious moments that needs the camera within seconds. What’s impressive is how much the UI of the phone has improved. Gone are clunky icons and resource-intensive animations. They are replaced with a theme that’s very similar to Google’s material design. The iPhone-like control panel is now gone and the quick settings options are integrated with the notification shade. Thankfully, Coolpad didn’t throw popup ads while browsing the UI which had been the case with its previous phones. There are new wallpapers and even the charging animation has changed and looks pretty slick. The Settings app is more organised and there’s less bloatware to uninstall this time. Here again, the Coolpad Note 6 doesn’t care much for the trends. It has a single 13-megapixel shooter at the back with an f/2.2 aperture. The photos come out warm, fairly detailed with good colour reproduction. The dynamic range is just about what you would expect at that price. Elements in the shadows are only vaguely detailed with most turning into silhouettes. Close up shots come out fairly sharp but they don’t have the natural depth of field that other dual camera phones offer. The weakness of the Coolpad Note 6’s imaging setup becomes apparent in low-light. It takes time to focus, there’s noticeable noise in the photos and the lack of a pro-mode makes it even more difficult to shoot when light conditions aren’t optimum. Then again, this is one of the better cameras we have seen on a Coolpad phone in a long time, but it still won’t beat a Xiaomi device. There’s no portrait mode, which is all the rage in smartphones these days. Coolpad’s approach for the front camera is also quite interesting. You do find dual cameras, but it doesn’t offer you portrait selfies. Instead, it takes after last year’s Oppo F3 and offers a wide-angle lens for group selfies. There’s an 8-megapixel + 5-megapixel shooter up front. The primary lens takes your regular selfies with ample light and beautification effect. There’s also an option for the phone to tell you how old you are and how good you look (I got attractive, 25 and I’m quite happy about it). The wide-angle lens can accommodate a big group perfectly, but there’s significant loss in details when you zoom in. The Coolpad Note 6 runs on a 4076mAh battery that offers a full day of use. The UI this time is quite lightweight and doesn’t take up a lot of resources. I used the phone to browse the web, check social media, clicked photos, watched videos and played games. Pretty the much average use case amongst most 25-year old, good looking Indians. All that and by the end of the day, I still had around 20 percent charge left. Unfortunately, the phone doesn’t support fast charging so it takes over an hour and a half to charge the phone. But then again, that’s an acceptable compromise considering the time you can use the phone untethered. 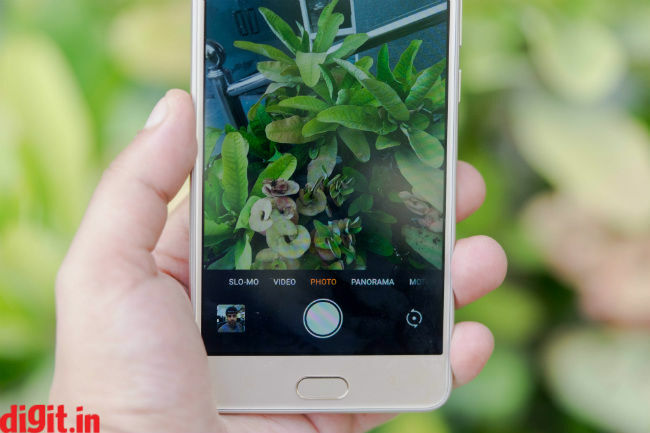 The Coolpad Note 6 comes at a time when the entire mid-range and entry-level smartphone segment has moved on to more powerful hardware offering better features. The phone is simply living in the past and lagging noticeably behind the competition. Then again, the Note 6 isn’t really competing with the Xiaomis and Honors of the world. It’s market is restricted to the offline retail space, that too in the tier 2 and tier 3 cities where brands like Coolpad, 10.or, Smartron are more popular. Among that crowd, Coolpad Note 6 with its glass design, older but brighter display, year-old processor and a decent camera performs better than expected. At Rs 9,999, you can buy the phone if you’re strictly against online brands, but in case you find the Redmi 5 or the Redmi Y2 available, they would be a better choice than Coolpad’s newest smartphone.